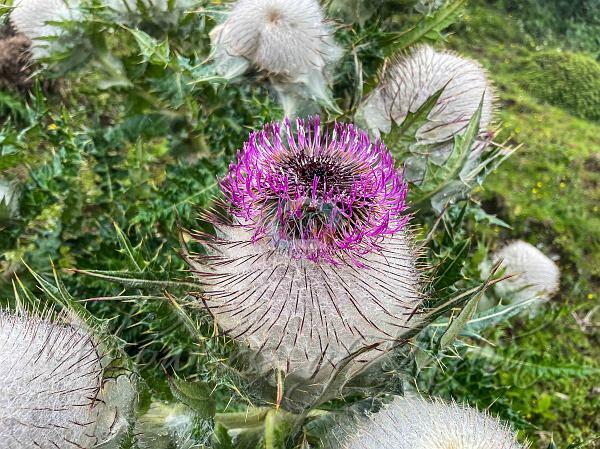 Wool Bearing Thistle is a rare perennial herb, which grows to 60-120 cm high. 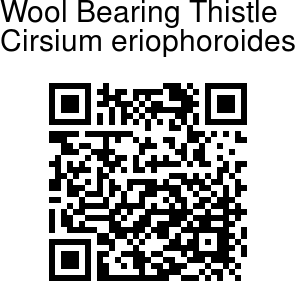 The species name eriophoroides comes from erion, meaning wool, and phoros to carry. It refers to the white wool like hairs carried by the flower-heads. Stem upright, sturdy, with the upper part covered with hairs. Lower and middle stem leaves are lancelike with no stalk. Leaves are lobed and the margins carry spines. Flower heads, 1-2, are carried on top of the stem. They are spherical, about 4-5 cm in diameter, with the bract-like lobules at the base. Flowers are dark purple, 3.8 cm long. The base of the flower-head is covered with white woolly hairs, with sharp, long spines jutting out all around.